Baton Rouge, La. – The Southern University Agricultural Research and Extension Center will host its 45th Annual Horse Show and Trail Ride, April 10-11 at the Maurice A. Edmond Livestock Arena in Baker, Hwy. 61 N. Trail riders from as far away as Texas, Mississippi, and North Louisiana will gather in Baton Rouge for the event. Gates open at NOON on Friday, April 10, 2015 to welcome riders and on Saturday, the kids’ horse event starts at 10:00 am as well as the trail ride. 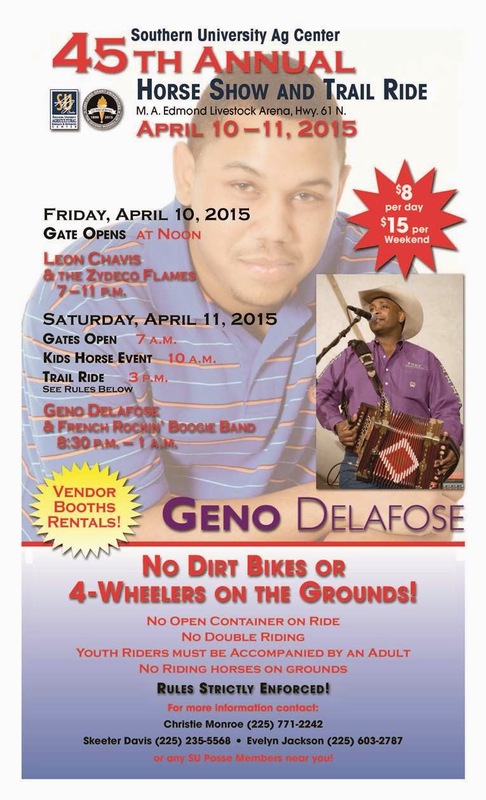 Leon Chavis and the Zydeco Flames will perform at 7:30-11 pm. The event will move into full gear on Saturday, April 11 at 7:00 am, with the Kids Horse Event following at 10:00 am, and a Trail Ride from the Arena promptly at noon and returning at 3:00 pm. The horse parade with participating riders of all ages will race around the Baker area with different horse riding associations. First and second place winners will be selected by judges to receive various prizes. Geno Delafose & Fench Rockin’ Band will perform at night from 8:30 PM - 1 AM. This family-friendly event is open to the public and a ticket will cost $15 for the weekend, or $8 per day. Vendor booth rentals are available. The following rules will be strictly enforced: No dirt bikes or 4-wheelers will be allowed on the Show grounds. Open containers or double-riding are Not Allowed on rides. Youth riders must be accompanied by adults. There will be no horse riding on the grounds. For further detail, please contact Christie Monroe at 225-771-4350 or via email: christie_monroe@suagcenter.com; Skeeter Davis at 225-235-5568; Evelyn Jackson at 225-603-2787 or any SU Posse Members near you! OPELOUSAS, LA – Do you want to make Living Healthy fun for youth? 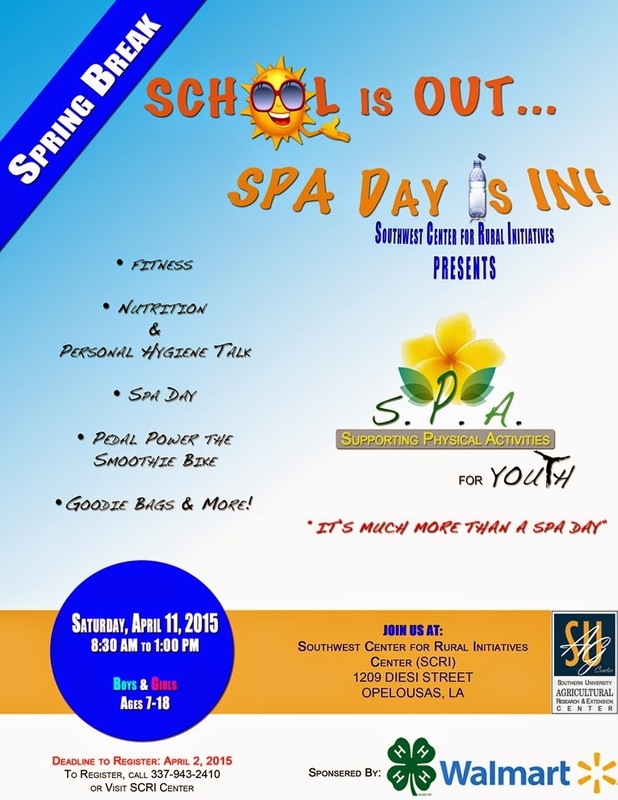 The Southwest Center for Rural Initiatives “Supporting Physical Activities (SPA) for Youth” event is doing just that on Saturday, April 11, 2015, from 8:30 a.m. – 1 p.m. at 1209 Diesi Street, Opelousas, La 70570. The SPA program is a worthwhile event to make youth find new alternatives towards achieving healthy lifestyles in a fun and exciting way. · Spa goodie bags and more! This FREE program is open to youth ages 7 – 18. Please note: Pre-registration is required for event participation to help with proper preparation. All participants must bring comfortable workout attire, and be ready to have a Spa Day experience! Parents are welcome to stay and have fun too. Baton Rouge, LA - The 11th Annual Procurement “CONNECTING BUSINESSES TO CONTRACTS CONFERENCE” will be held at Southern University’s Smith Brown Memorial Union, April 9, 2015 on the Baton Rouge campus. 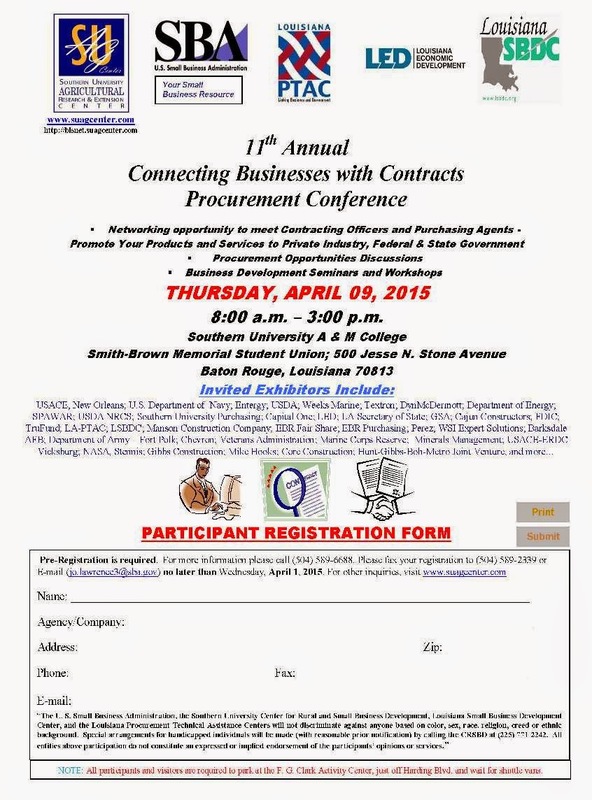 The goal of the conference is to stimulate the economy by aligning existing and potential business owners, small contractors, non-profit organizations, and others with contracting officers, and purchasing agents, as well as providing an outlet to network and exchange information and ideas. 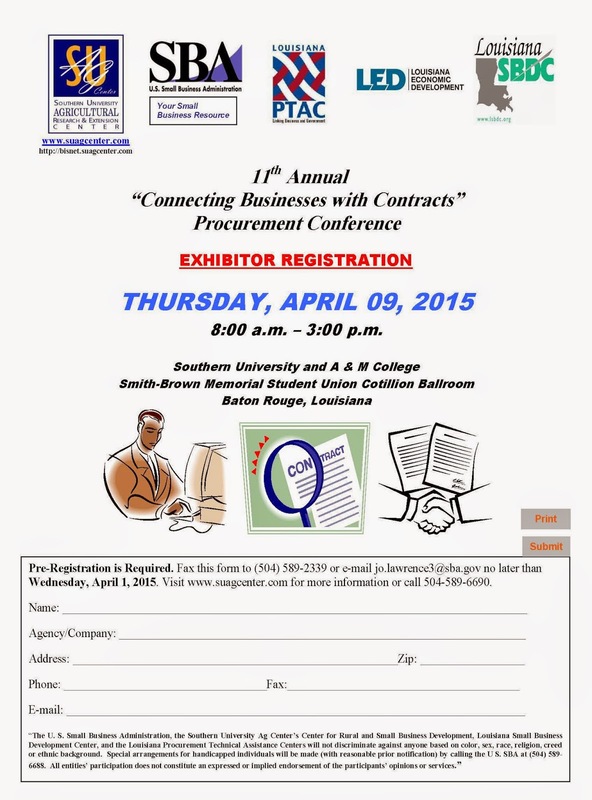 Pre-registration is required by April 1st for all exhibitors and participants. Registration form can be faxed to (504) 589-2339 or e-mailed jo.lawrence3@sba.gov no later than Wednesday, April 1, 2015. Visit www.suagcenter.com and click on “Events” for more information or call 504-589-6690. Baton Rouge, LA – Leodrey Williams, Chancellor of the Southern University Agricultural Research and Extension Center officially announced his retirement during the Southern University Board of Supervisors’ meeting today. 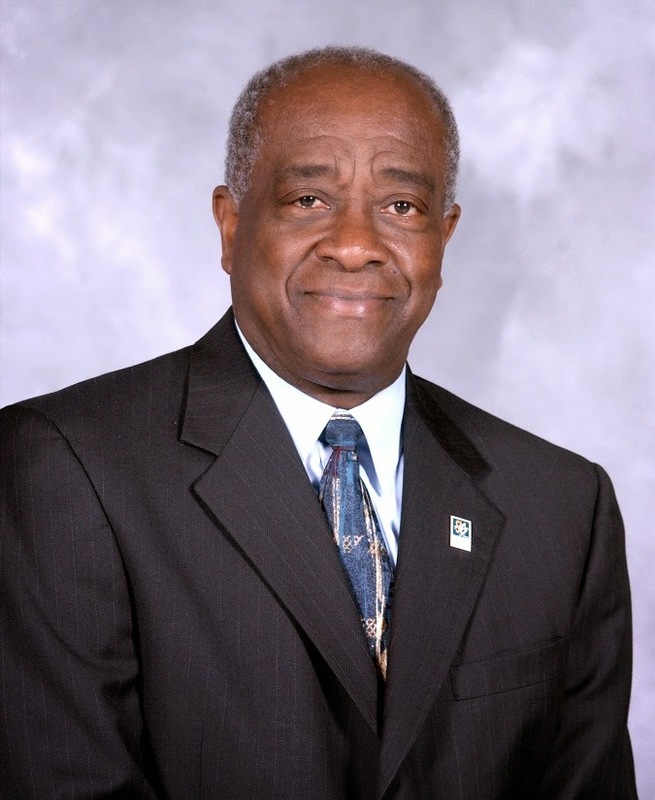 His announcement comes after serving for the past 50 years, working with both Southern University and LSU in Baton Rouge, as well as Washington DC at the national level, in Cooperative Extension Service. Over the past 14 years, he has served as the first and only chancellor of the Center. His retirement from the university will be effective June 30th 2015. Williams was hired as an agriculture specialist 50 years ago. Five years later, he went to LSU and served as associate state agent, director of Equal Employment Opportunity and associate professor in the Department of Extension and International Education, positions he held for four years. In 1980, he became extension director at Southern University. Soon after, Williams would move to Washington DC where he served as the national director of the Cooperative Extension Service, making him responsible for funding extension programs at 104 land-grant universities around the country. Williams returned to Southern University and resumed his previous role as Extension Director in 1995. Then, in 2001 Williams was asked to head the newly-formed Southern University Agricultural Research and Extension Center. 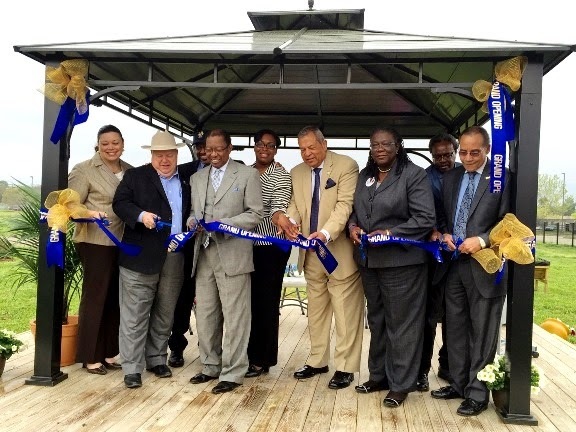 The SU Ag Center, the 5th campus of the Southern University System was established on July 1, 2001. The mission of the Center is to conduct basic and applied research, and disseminate information to the citizens of Louisiana in a matter that is useful in addressing their scientific, technological, social, economic and cultural needs. Friday has exciting and dynamic activities lined up, including Health Symposium, Undergraduate and Graduate Research Poster and Oral Contests, Graduate/Professional Workshops, National Written Essay Contest, National Public Speaking Contest, Research Discussion Contest, Agriculture and Science Photography Contest, and Career Fair. 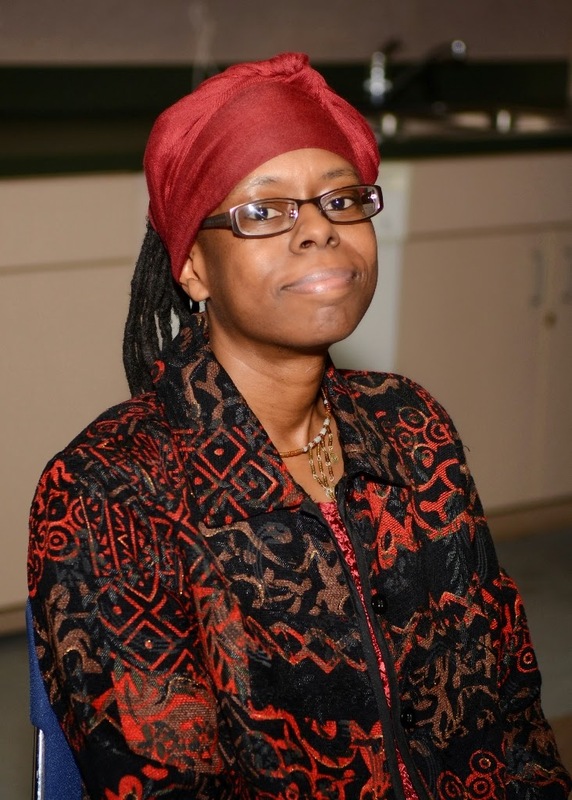 Last year, SU students brought home top prizes and this year, Professor Patricia Meyinsse in Agricultural Economics has eight students under her supervision to present in the oral and poster categories. We are rooting for them to do great again this time around. Baton Rouge, La – The Louisiana Housing Alliance will host a state Housing Conference themed, "Home Matters: Promoting Growth and Sustainable Neighborhoods" where exciting and dynamic content is lined up. The conference will take place at the University of Phoenix, 2431 South Acadian Thruway, Baton Rouge, from March 31 to April 1, 2015. The event will begin at 8:30 am each day and the agenda is available online. Click here to view and download the agenda. You are invited to attend! Also on the Agenda are Mr. Clarence Hawkins from USDA Rural Development, Representative from LISC, Mayor Robert Myer of New Roads and the Louisiana Housing Corporation will all be participants to discuss important affordable housing topics. Make sure to register if you haven't already! PS: Also, if you're attending from another part of the state and need hotel accommodations, we've got discount information available on our website. Baton Rouge, La. – The Southern University Ag Center touts the success of the five events hosted March 19-21 for the 5th Louisiana Small Farmers Conference. The Ribbon Cutting Ceremony for the Sustainable Ag Urban Demonstration Farm was the perfect beginning to a wonderful series of events. Two local schools attended the ribbon cutting along with 20 farmers and all of the dignitaries to include Hon. Mike Strain, Commissioner, LA Dept. of Agriculture and Forestry; the Hon. Melvin “Kip” Holden, Mayor-President, EBR Parish; Representative Dalton Honore, District 63; Dr. Monique Winfield, Vice President, SU System; Mr. Flandus McClinton, Interim Chancellor, SUBR; Dr. Adell Brown, Jr., Executive Vice Chancellor and VC for Research, and Dr. Gina E. Eubanks, Vice Chancellor for Extension, SU Ag Center. One of the students from Martin Luther King Christian Academy told his teacher that he was planning on attending college at LSU, but now he has to come to Southern for college to check on the plant he planted in the raised bed in the farm. (That's cute and speaks volumes to the innocence of children). We already have six requests for other school groups to tour. “The evening ended with a reception that everyone enjoyed,” said Dr. Dawn Mellion-Patin, event coordinator. On Friday, the conference moved into full gear with moderators and presenters working as a team, followed by the Louisiana Living Legends Banquet at night. 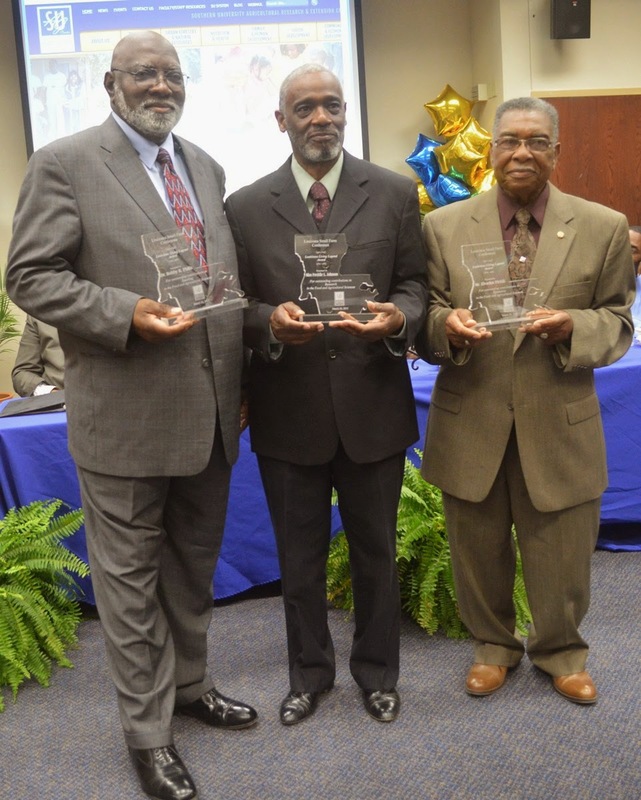 The three legends honored were: Dr. Bobby R. Phills, program director for the Science Center and professor in the College of Engineering Sciences, Technology and Agriculture at Florida A&M University in Tallahassee; Mr. George Moody accepting the award for Ms. Freddie Johnson, his aunt, a retired Southern University food and nutrition professor; and Mr. Elvadus Fields, former county agent and farm management specialist at Southern University, now retired, of St. Joseph. Terrence Marshall, Extension Agent, East Baton Rouge Parish, was the speaker and shared the history of the 2nd Morrill Act, the legislation that created the 1890 land grant institutions in an outstanding fashion. The conference concluded with Louisiana Small Farmer Agricultural Leadership Institute Graduation Ceremony, held on Saturday morning with 14 participants graduating, including Extension Country Agents, Odis Hill, Morehouse & Union Parishes; and Thomas Legiandenyi, East and West Carroll Parishes. Terry Washington, Rapides Parish, graduated in the previous class. The graduation speaker was Felicia Bell, graduate of Class II of the regional leadership class. And the highlight of the event was Miss Christina Gary, a seven-year old 3rd grader performing an excerpt from a sermon by Bishop Eddie Long and another from Maya Angelou's poem, “Still I Rise.” Her renditions were the best tributes to our new leaders. An article entitled Three new members join Southern U’s agricultural ‘legends’ features the Louisiana Living Legends Banquet and is available on the LSU AgCenter website. The event was organized by Dawn Mellion-Patin, Ph. D., MBA, Specialist, Agriculture, and Project Director, who can be reached at (225) 771-2242. BATON ROUGE, La. 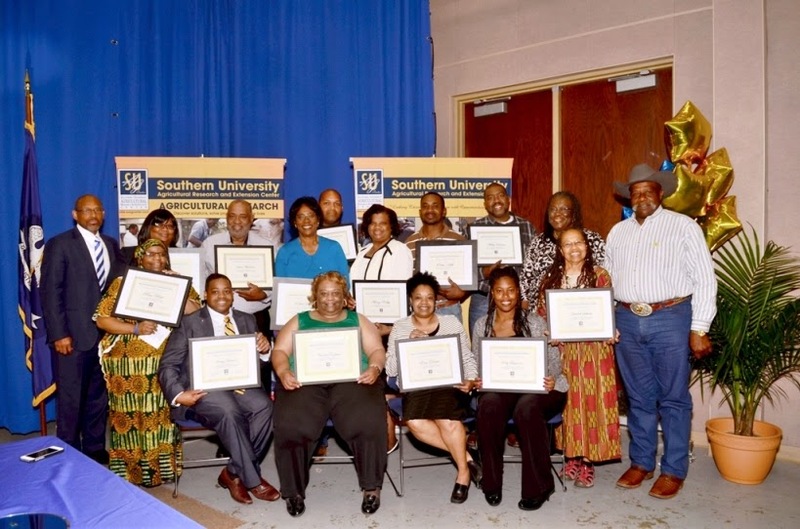 – Three individuals were recognized as Louisiana Living Legends during the fifth annual Louisiana Small Farmer Conference at the Southern University Agricultural Research and Extension Center on March 20. They are Bobby R. Phills, program director for the Science Center and professor in the College of Engineering Sciences, Technology and Agriculture at Florida A&M University in Tallahassee; Freddie Johnson, a retired Southern University food and nutrition professor, of Baton Rouge; and Elvadus Fields, former county agent and farm management specialist at Southern, now retired, of St. Joseph. These three join 15 others who have been honored with this distinction since 2005. “The Louisiana Living Legends Award is an opportunity to honor heroes with ties to the Southern University Agricultural Research and Extension Center for their years of selfless service,” said Dawn Mellion-Patin, agricultural specialist and organizer of the small farmer conference. Dr. Phills is the former dean and research director of the College of Agricultural, Family and Consumer Sciences at Southern. 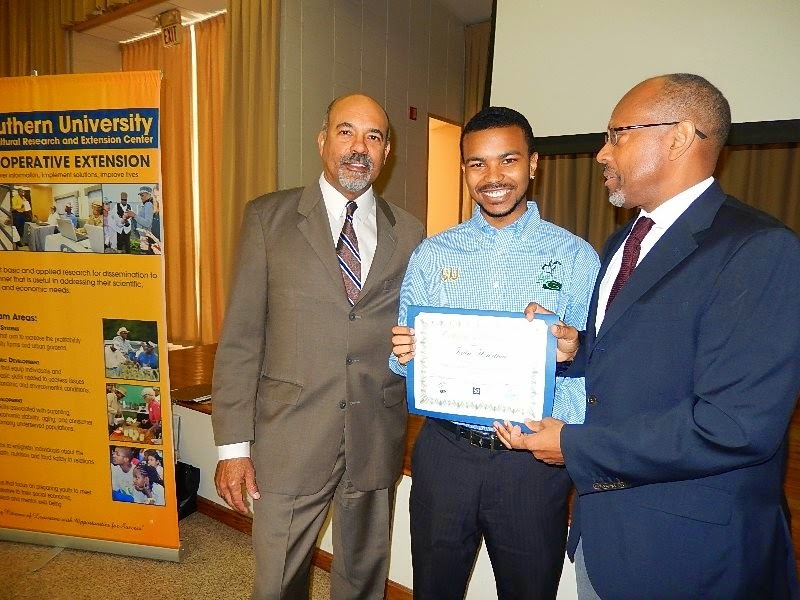 In this role he created the Beginning Agricultural Youth Opportunities Unlimited (BAYOU) Summer Enrichment Program, which exposed hundreds of high school students across Louisiana to the broad array of careers in the agricultural sciences. “This program was responsible for placing hundreds of student interns at major research universities, in private industry and with the USDA,” Mellion-Patin said. Ms. Johnson served for 36 years in the Department of Human Nutrition and Food at Southern. Before that she was supervisor of food service for the state Department of Education. Her activities included sensory evaluation and establishing a staff sensory panel, design of a food research sensory evaluation area and a home economics space utilization study. 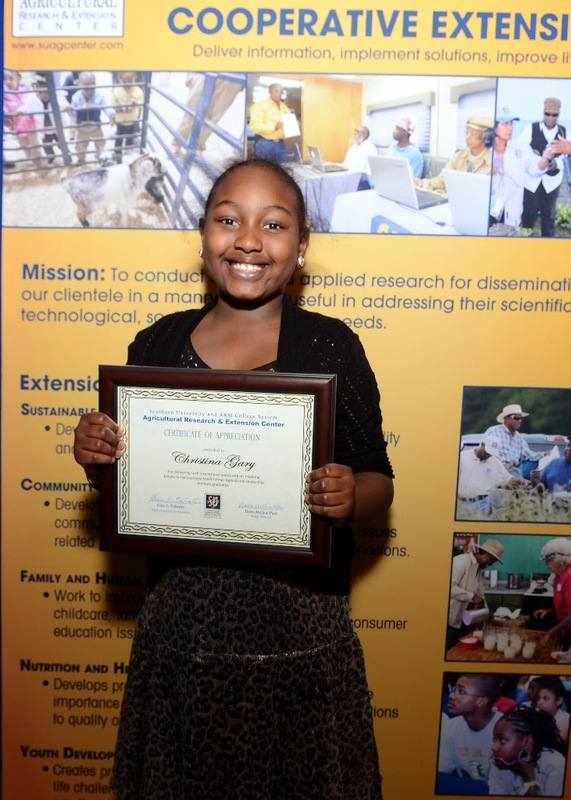 Her research included the palatability of “rabbit nuggets” and other alternative food products for limited resource families. Mr. Fields was a county agent for the Louisiana Cooperative Extension Service for 32 years and then became a farm management specialist for Southern. He has been a supporter of the SU Livestock Show and was responsibility for bringing more than 150 youth to show animals for more than 50 years. He was a founding member of the Delta Livestock Enterprise and Northeast Louisiana Black Farmers and Landowners Association. During this year’s small farmer conference, the 125th anniversary of the establishment of the 1890 land-grant universities was also celebrated, said Gina E. Eubanks, vice chancellor for extension at the Southern Ag Center and program leader for nutrition and food sciences at the LSU AgCenter. 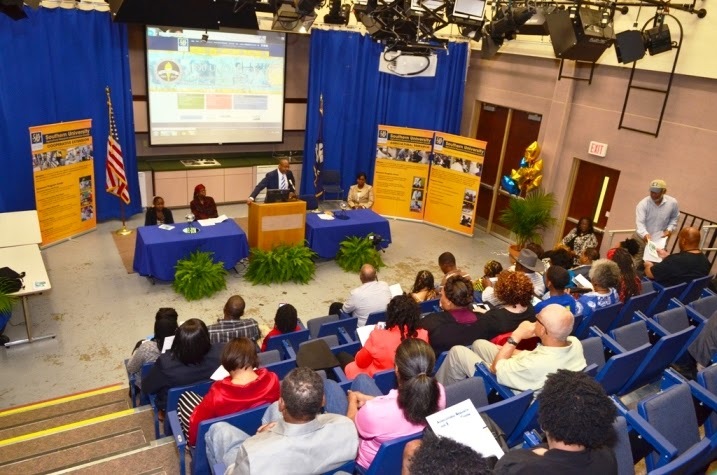 Southern University is one of 19 universities across the country with 1890 land-grant status. In 1890, Congress passed the Second Morrill Act with the stipulation that African Americans were to be included in the land-grant university system. The first Morrill Act was signed into law by Pres. Abraham Lincoln in 1862. There is an 1862 land-grant university in every state including LSU in Louisiana. The other 15 Living Legends include Bernestine McGee, Floyd Jenkins, Elsie Cyrus, Samuel Donald, Alonzo Chappell, Sara Sims, Pecola Scott, Willie T. Sensley, Owusu Bandele, Leodrey Williams, James McNitt, James Archie, Solon Marshall, Kirkland Mellad and Wesley Crawford. Baton Rouge, La.-The USDA Natural Resources Conservation Service (NRCS) in Louisiana has planned a series of soil health workshops across the state during the first week of April. Farmers and ranchers are invited to participate and learn more about the importance of soil health, cover crops and forage management in pasture and row crop production. Pre-registration is not required and there is no cost to attend. Guest speakers will include Ray Archuleta, Conservation Agronomist from the NRCS East National Technology Center in Greensboro, North Carolina, as well as several soil health and cover crop specialists with the LSU AgCenter. NRCS will also demonstrate the benefits of improving soil health and cover with a rainfall simulation trailer. If you have any questions or need more information about the workshops, please contact Michael Lindsey at (318) 473-7757 or by e-mail at michael.lindsey@la.usda.gov. The NRCS provides reasonable accommodations for individuals with disabilities. To request special accommodations(s), contact Terry Barron at (318) 473-7815 at least ten days prior to the date of the meeting or event. New Orleans, La. – The “Y.E.S. 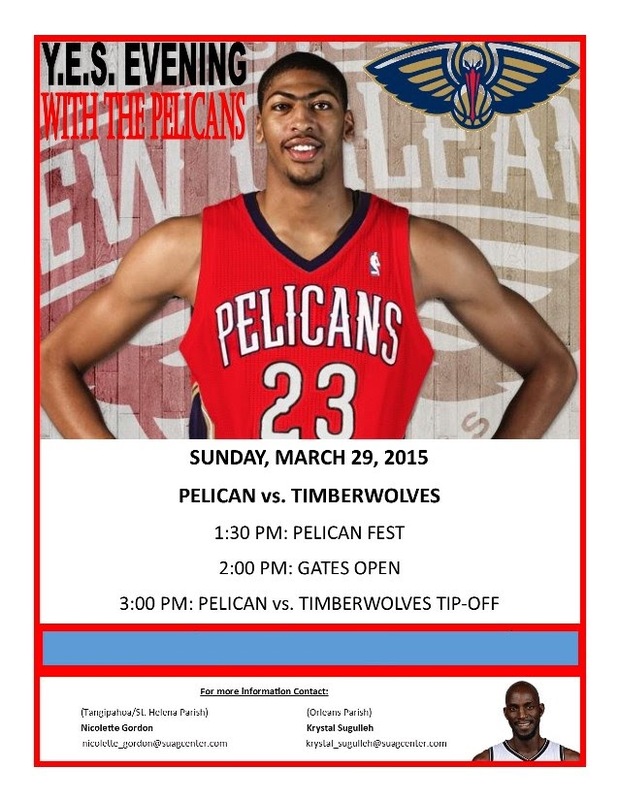 Evening with the Pelicans” vs the Minnesota Timberwolves will be held on Sunday, March 29th. By purchasing tickets to this game, Youth Educational Support (Y.E.S.) after-school program, participants will have exclusive access to Pelican Fest. Each student will also get a Pelicans key chain, available during the festivities. The Pelican Fest will include games, activities, pictures, autographs, and much more! During half-time, the Y.E.S. Program will be recognized for its community efforts in Tangipahoa, St. Helena & Orleans Parishes. For more information, please contact Nicolette Gordon in St. Helena Parish on Tuesday and Thursday at – 225-222-4136 and in Tangipahoa Parish on Monday, Wednesday and Friday at – 985-748-9381, or Krystal Sugulleh at - 504 - 658-2900. Baton Rouge, La - Small farmers from across Louisiana have gathered at the Southern University Agricultural Research and Extension Center today for the 5th annual Louisiana Small Farmers Conference. The event was kickoff with a ribbon-cutting ceremony for the Sustainable Urban Ag Demonstration Farm, a “show and tell garden.” The grand opening event was graced with the presence of the Hon. Mike Strain, Commissioner, LA Dept. of Agriculture and Forestry; the Hon. Melvin “Kip” Holden, Mayor-President, EBR Parish; Representative Dalton Honore, District 63; Dr. Monique Winfield, Vice President, SU System; Mr. Flandus McClinton, Interim Chancellor, SUBR; Dr. Adell Brown, Jr., Exec. Vice Chancellor& VC for Research, Dr. Gina E. Eubanks, Vice Chancellor for Extension, SU Ag Center. The three-day conference, themed “Showcasing Louisiana’s Small Family Farms,” is designed to educate, provide expanded awareness of educational opportunities, USDA programs and services and other resources to help small farmers stay in business. This event will also assist individuals interested in starting an agricultural business while sharing resources for others who are interested in urban farming. The conference will also include a presentation on the 2014 Farm Bill and the opportunities it provides to small farmers; the Louisiana Living Legends Banquet, which honors individuals who have made significant contributions to Southern University in the area of Agriculture, Family and Consumer Sciences, and will end with the graduation ceremony of the Louisiana Small Farmer Agricultural Leadership Institute on Saturday, March 21. The conference is coordinated by Dr. Dawn Mellion-Patin who can be reached at 225-771-2242 or via e-mail at dawn_mellion@suagcenter.com. Baton Rouge, La. 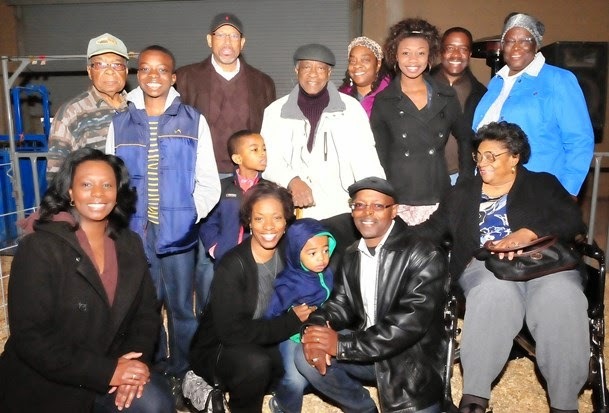 – The Southern University Ag Center celebrated National Ag Day 2015 with the nation. The celebration was in observation of the value of agriculture in our daily lives. 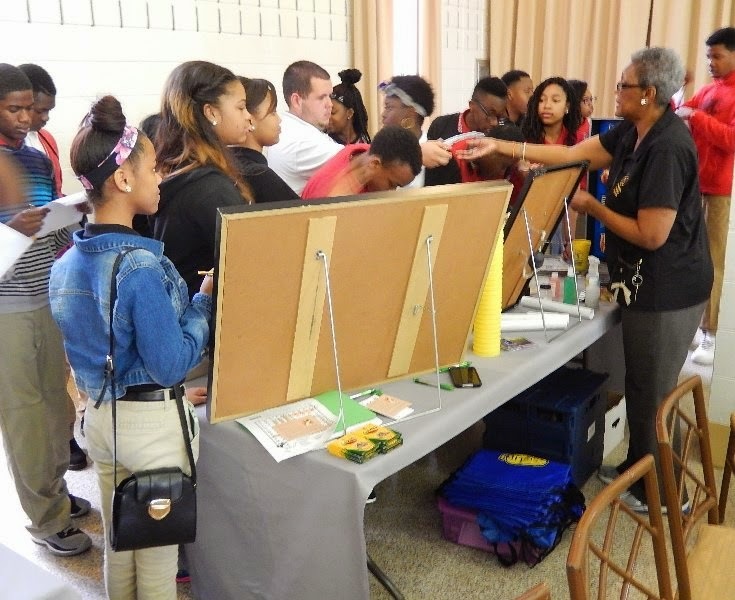 Students from the College of Sciences and Agriculture at Southern University; and Broadmoor, Glen Oaks, Tara, and Zachary High Schools in Baton Rouge were joined by Zachary Career & Technical Center and St. Helena College & Career Academy for the event. 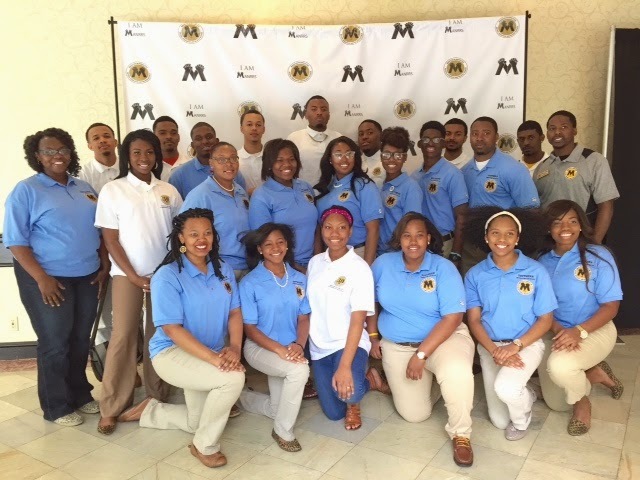 They were urged to continue the great legacy by preparing themselves to be the future faces of agricultural leadership. In addition to interacting with faculty, staff and administrators, the college students presented posters based on their research, were judged and awarded prizes for their posters. Participants had an opportunity to watch the 1890 video to remind them about their impact on the next generation in keeping with the theme of the 125th Anniversary of the Second Morrill Act. 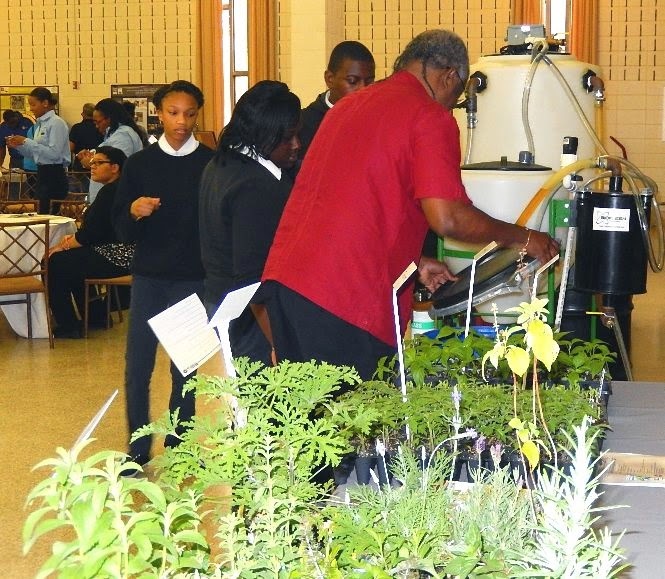 Among those who welcomed the students to the National Ag Day celebration were Dr. Ronald Mason, President SU System; Dr. Adell Brown Jr., Executive Vice Chancellor/Vice Chancellor for Research; Dr. Gina E. Eubanks, Vice Chancellor for Extension; and Dr. Andra Johnson, Associate Professor, Urban Forestry. The event was coordinated by Dr. Renita Marshall, Associate Professor, Animal Science and Dr. Kenyetta Smith, Associate Specialist, Community & Economic Development. Baton Rouge, La. - Louisiana Department of Agriculture and Forestry Commissioner Mike Strain, D.V.M., said, "In an effort to safeguard our commercial producers and backyard poultry enthusiasts, we've increased our surveillance of poultry in the state. We are also enforcing all Louisiana Board of Animal Health entry regulations." Louisiana is taking precautionary measures following the recent confirmed presence of the highly pathogenic H5N2 avian influenza (AI) in commercial turkey flocks in these six states: Idaho, Minnesota, Missouri, Oregon, Washington and most recently Arkansas. No live poultry or poultry products may enter Louisiana from an area designated as a Highly Pathogenic Avian Influenza (HPAI) infected zone until the official quarantine has been released; Poultry includes chickens, turkeys, quail, pheasants, peafowl, guineas, chukars and other partridge, grouse, ratites and domestic ducks; Poultry products include hatching eggs, chicks, poults, table eggs, litter, and offal, but do not include processed poultry meat for human consumption; All poultry entering Louisiana must originate from a National Poultry Improvement Plan (NPIP) AI clean flock or must be tested negative for AI within 7 days of entry (by antibody or antigen capture methodologies recognized by NPIP); All poultry shipments into Louisiana must be accompanied by an Interstate Certificate of Veterinary Inspection (ICVI) and proof of NPIP certification for Salmonella Pullorum/Typhoid (P/T) clean status with NPIP Form 9-2 or NPIP negative testing within 30 days of entry; ICVI must state origin of shipment. Late Wednesday, the Arkansas Livestock and Poultry Commission confirmed the infection of H5N2 AI in a commercial turkey flock in northern Arkansas. The flock is currently quarantined. The Arkansas Livestock & Poultry Commission will follow strict U.S. Department of Agriculture protocols to depopulate the affected flock so that no affected birds will enter the food supply. Additionally, surveillance and testing procedures will be implemented at properties near the affected facility to insure that the virus has not spread. The virus is not known to cause disease in humans. These virus strains can travel in wild birds without them appearing sick. People should avoid contact with sick/dead poultry or wildlife. If contact occurs, wash your hands with soap and water and change clothing before having any contact with healthy domestic poultry and birds. 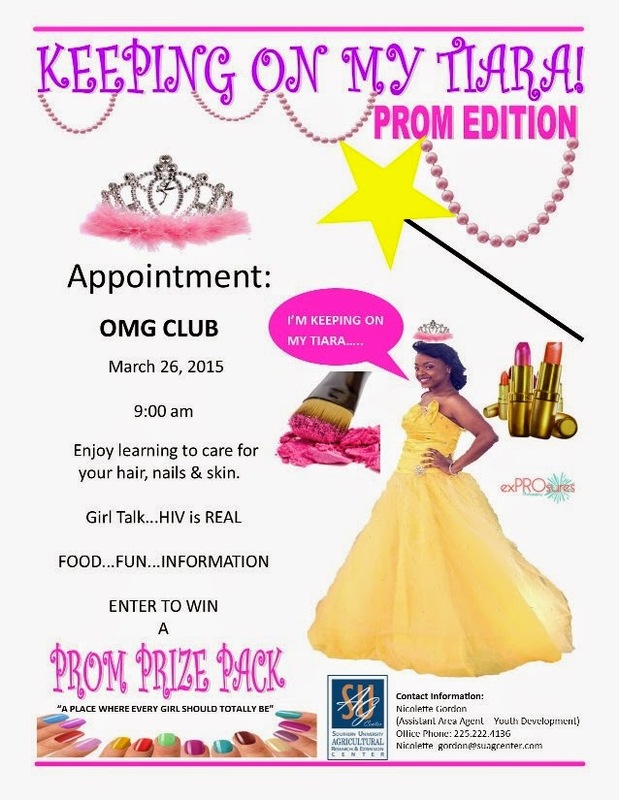 Greensburg, La – The Southern University Agricultural Research & Extension Center in conjunction with the Outstanding Mature Girlz Organization will kick-off the Prom Edition of “Keeping on My Tiara!” This tour will start on Thursday, March 12, 2015 at the St. Helena College & Career Academy in Greensburg, making its last stop in April at Kentwood High Magnet School. This tour targeting girls will feature local Hairstylists, Makeup Artists, and Nail Technicians. These professionals will teach the Outstanding Mature Girlz the importance of caring for their hair, skin, and nails. Sashika Baunchand, Regional Advocate for Aids Healthcare Foundation, will be onsite to educate the young ladies on HIV/AIDS. For more information on the tour, contact Nicolette Gordon in St. Helena Parish on Tuesday and Thursday at – 225-222-4136 and in Tangipahoa Parish on Monday, Wednesday and Friday at – 985-748-9381. Baton Rouge, LA - A new video on “Garden Using Apps” is available via our YouTube channel at https://youtu.be/YyWpOX-9RjU. The video was produced in partnership with LPB, the YMCA and the SU AgCenter. This is the fourth of six videos being produced through the “Plant It, Grow It” project. Baton Rouge, LA - The Southern University edition of the 125th Land-grant video is available on the SU Ag Center website and can be accessed via the 125th Banner on the site or via our YouTube channel. Baton Rouge, La. 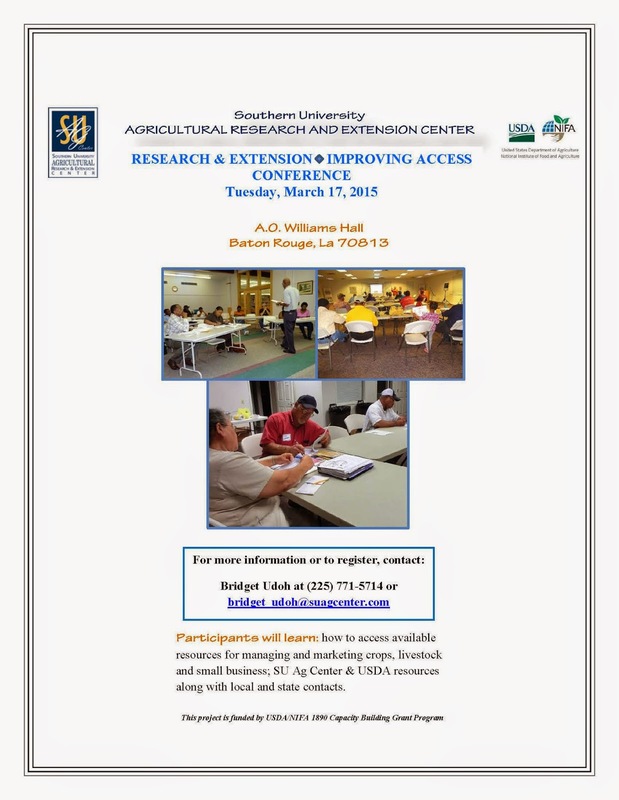 –The Southern University Ag Center is inviting small farmers and business owners to a conference that will discuss ways to improve access to information. The event will take place on Tuesday, March 17, 2015 from 8:00 am-2:00 pm at A.O. Williams Hall. Participants will learn how to access available information in a timely manner for managing and marketing crops, livestock and small businesses. Information sources will include SU Ag Center, USDA, local and state agencies as we celebrates National Ag week. This event is open to the public and funded by USDA/NIFA 1890 Capacity Building Grant Program. Dr. Gina E. Eubanks, VC for Extension. 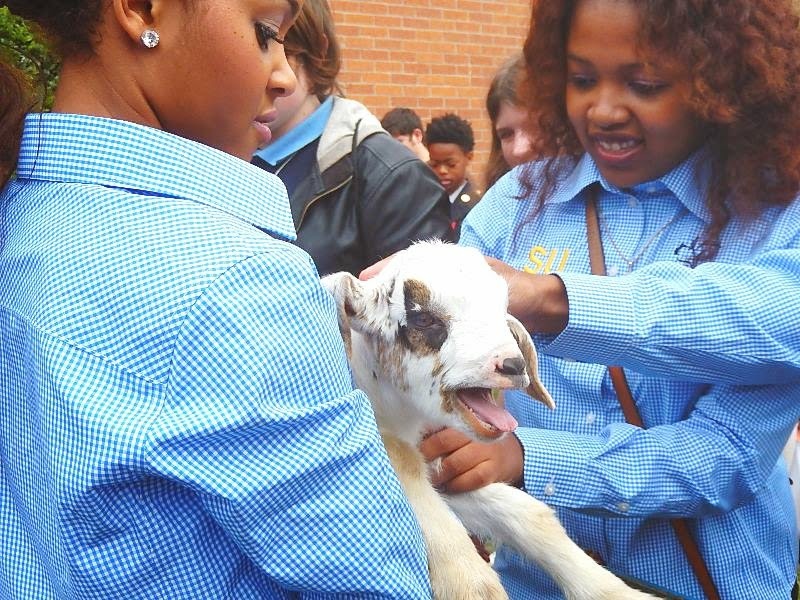 Baton Rouge, LA - The Southern University Agricultural Research and Extension Center concluded its 72nd Annual Livestock Show with more than 350 participants from across the state on March 7th. During the two-day event, young farmers and ranchers from across the state had the opportunity to display animals that have been showcased or have won in-parish competitions. After the show, judges named state champions in various breeds of beef and dairy cattle, hogs, sheep, lamb, and goats. The all-time favorite mini-farm, featuring a variety of small farm animals, was held for school-age kids from the local schools. In addition, tours were provided to discuss different animals, their food sources, farming, and how agriculture affects everyone's life. Showmanship was judged in different categories for awards. Winners received premiums, rosettes, ribbons, and banners. An awards presentation for exhibitors of champion market animals was held, followed immediately by the Junior Auction Sale. This year’s show honored Chancellor Leodrey Williams for 50 years of dedicated service to the SU System and commitment to the Livestock Show. Livestock show organizer, Christie Monroe, Livestock Show Program Director, can be reached at (225) 771- 4350.